I have had problems with the trailer for several years. I don’t even remember how long ago it was that one of the axles broke loose and I stripped it down to the frame and rebuilt it. I strongly suspected then that I di not get the axles welded back in perfect alignment as I did not have a jig to build it in and pretty much nothing was square any more. 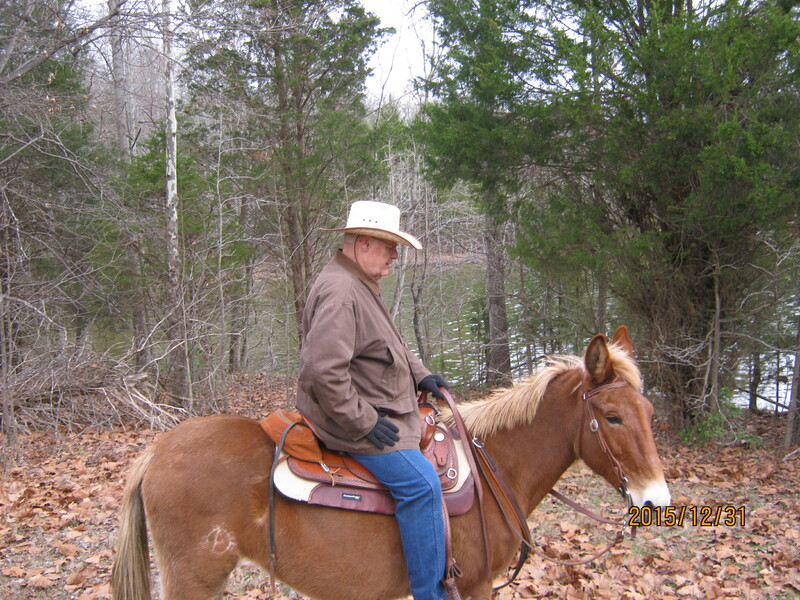 When I started riding with Stewart, he liked to have company on the travel to the venues and he told me that if I could get my horse to his house then we would all ride together. He only lived about five miles from me. It became habit. And Marie has not been well…So I am hesitant to go far away and never over night. And then there is the new wood stove…cutting wood for the monster has filled the void in my life. Cut wood….split wood….haul wood…burn wood…I should be in better shape than I seem to be…. And now there is the coal stove…we have two stoves and this year we replaced the old one, which needed a good bit of work ,with a Chubby coal stove. I picked up a pallet of bagged coal yesterday…50 fifty lb bags to a pallet. 2500 lbs. I took the tractor to lift the pallet out of the trailer and while the hydraulics would lift it….what got lifted was the rear end of the tractor. I had the wood splitter on the tractor and that is almost the heaviest thing I have to put on it….so I unloaded half of the coal by hand….then the tractor would stay on the ground. 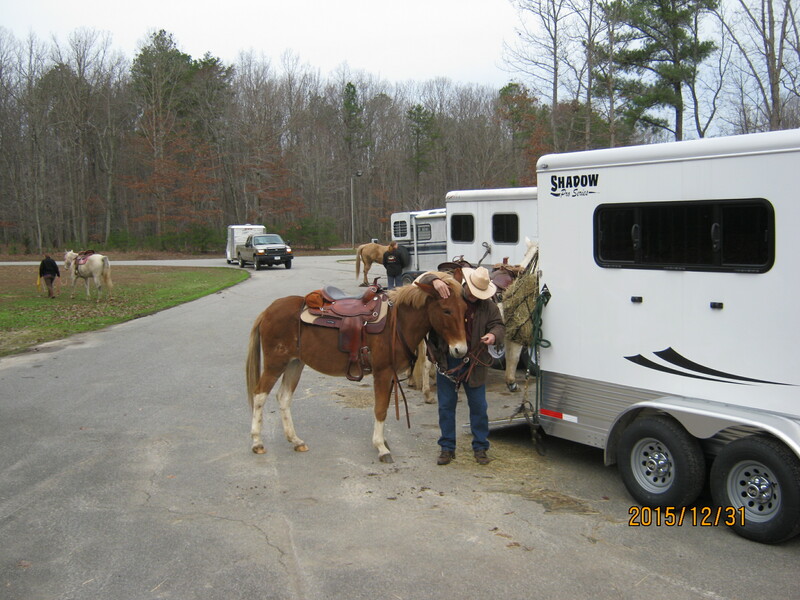 Then my trailer died again….one wheeel fell slam off and the bearing and hub were shot…I sold it to a guy to use as a chicken house…It had become too untgrust worthy to puyt my horses in. During the intervening time, Stewart had sold his big gooseneck because it was difficult for him to get in and out of his property and he did not need all that trailer…he bought a two horse bumper pull…but after a year he found he did not like it and went back to a larger gooseneck. It helped that someone with some farm machinery accidentally knocked down the main obstruction on his driveway, making access easier. I bought the bumper pull from him sight unseen. So the trailer excuse is out the window. The tale of getting a title and a license is another story in itself…but it is licensed and inspected and street legal. Then for Christmas I got a lifetime state park riding pass. Marie mumbled something about needing an attitude adjustment. I thought she was just making more idle threats. Anyhow, well before Christmas Stewart started talking about coming to the New Years day ride. And then the Christmas monsoon set in and it rained for a fortnight. But then Jim and Colleen posted that the ride was on and so I broke the news to Perkins that we were going and he went and rolled in a mud puddle…I swear he stuck his tongue out at me…. So we made the trip and I was hustling trying to make sure I had all my stuff together and trying not to be late…still forgot the GPS…so I had to guess at how many miles we rode. When I pulled into the lot there was not another trailer in sight…I had faith and unloaded Perkins and began to scrape away the mud…he literally was covered….About ten minutes later a rig unfamiliar to me pulled in and it was Stewart….shortly after that other trucks started arriving. Stewart and I were the first ones mounted and we set out. While over thirty riders were in attendance we never saw any of them while we were riding…We rode the lake side loop and the little loop and half of the power line loop…We got to the big hills and decided it was too slick to go for a hill side slide on those steep hills and Perkins was about worn out by then anyway. So we doubled back and got back in time to scavenge some lunch….we were there at the appointed time but most others had come back early and a lot of folks were leaving by the time we ate. But we managed to find something to eat…We were not the last ones back and the reinforcements brough more provisions. 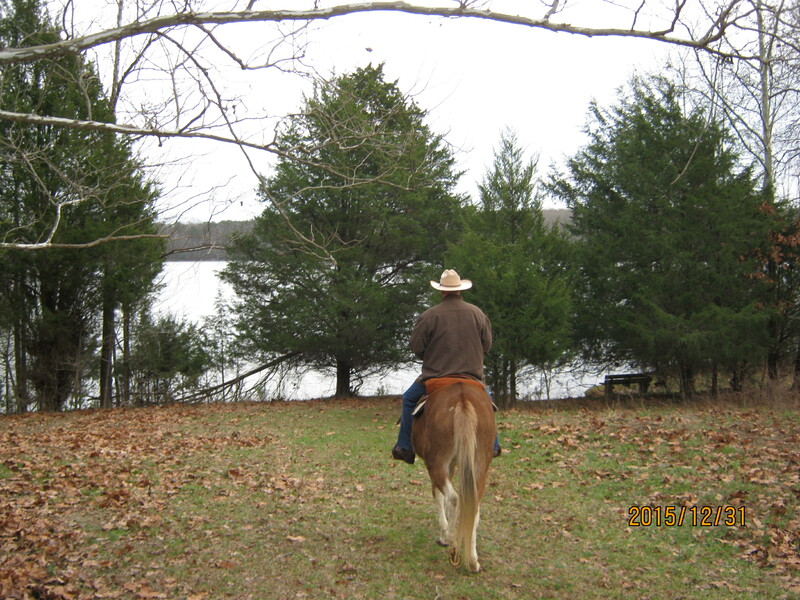 It was good to be back on a horse. It was good to ride with the PPRC again. It was good to enjoy the fellowship. It was good to meet some new folks. 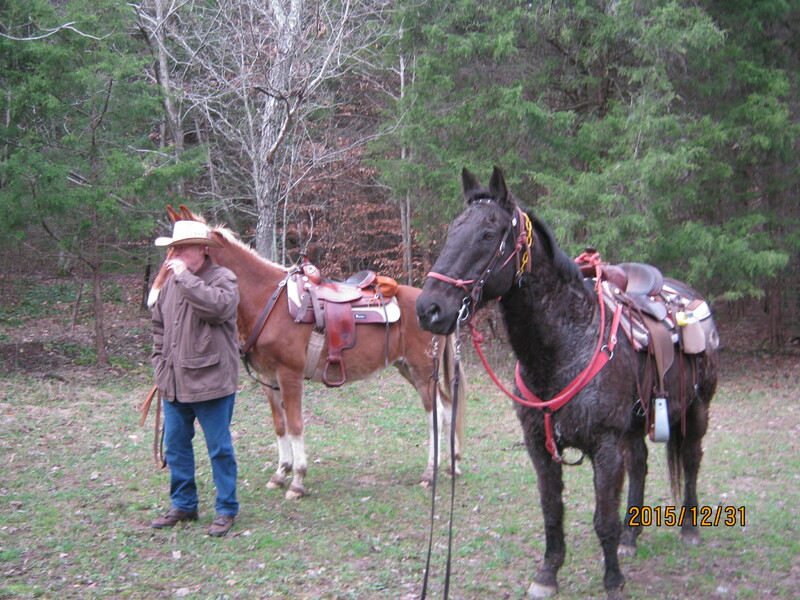 It was good to see my old riding buddy and his nice mule Dixie… Have to tell the story here…Stewart has gotten a new black Rocky Mare…Dancer. He was intending to bring her. He went out on the mountain to catch her in the dark. He could not find a black horse in the dark. She did not come to call…she did not come to the rattle of the feed bucket…Dixie, hearing the feed bucket appeared and followed Stewart all around the field in his quest to find Dancer and or Loretta…Finally with time getting tight and a long drive ahead of him, Stewart turned to Dixie and told her that since she volunteered it looked like she was elected. As we departed it seemed to me that it started to get cold. So the weather cooperated. Perkins enjoyed the new enclosed trailer. The day was delightful and hopefully for me it was an auspicious start to a new year.